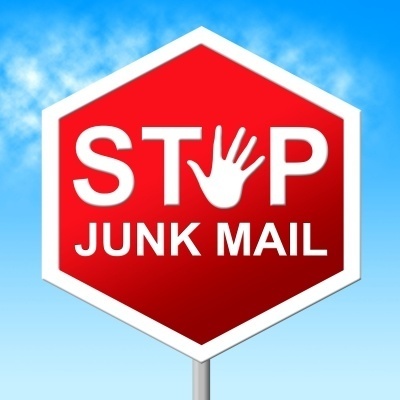 No one likes Junk Email clogging-up your Inbox. Most Email systems handle the most pervasive Spam Emails for you. But there are still a large number of low-priority and Junk Emails that often make their way through your Spam filters. They can be low priority notifications, newsletters from businesses, and other assorted “Junk”. But these types of Junk Emails can quickly fill-up your Inbox. One of the first steps in the 4Ds Inbox processing workflow is to identify and remove all the “Junk” and “Low Priority” messages. Anything that helps accomplish this can speed your Email triage activities. I recently came across an Email Overload article by Peter Leigh on his Mindful Marketeer blog. He provided a simple but powerful Junk Email filter and showed how to create it using Microsoft Outlook Rules. That’s it! Simple but powerful! Now, let's dissect it a bit and see why it works so well. Anti-spamming laws (such as "CAN-SPAM") require marketing and newsletter Emails to contain an "Opt-Out" option for the recipient. To accomplish this, most of these types of Emails will contain an “Unsubscribe” link in the Email for just this purpose. Therefore, the “unsubscribe” keyword will identify most “marketing” and “advertising” Emails. An Email with a “RE:” in the subject usually indicates it is a "reply" to an earlier messages. So, even if there is an “unsubscribe” in the Email, as long as there is a “RE:” in the subject line, it won’t move to the separate Email folder. So that’s it… short, sweet, and powerful! 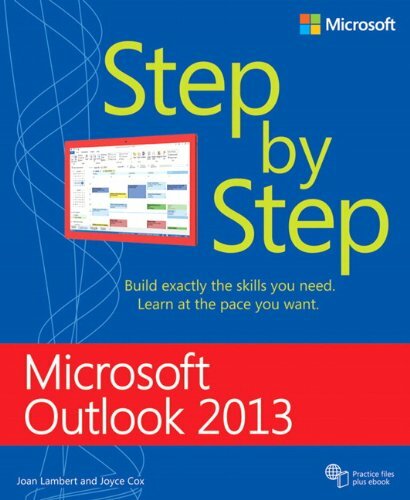 Now, let’s look at the steps to set-up this custom filter in Microsoft Outlook. Create a special folder for this Rule. I created a folder called “@Adverts”, right under my Inbox. "Right-click" on the folder and select "Properties". Set the radio-button to "Show number of unread items". So, now your special folder is set-up. 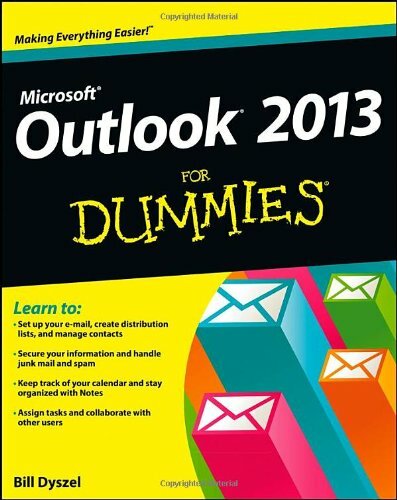 Now, let’s set-up the Outlook Rule. 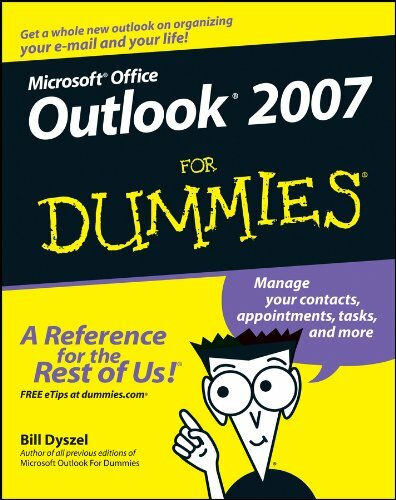 The way you access Outlook Rules depends upon your version of Outlook. So, now your "Rules and Alerts" dialog box should be displayed. Select “Apply rule on messages I receive”. Select the check-box for “with specific words in the body". In the bottom window, click on the “specific words” link. Enter “Unsubscribe” in the text box. Select the check-box for “move it to the specified folder”. In the bottom window that displays, click on the “specified folder” link. In the folder chooser window, navigate to your new folder (“@Adverts” in my example). If you forgot to create the folder, you also have the option in this window to create a “New” folder. Select the check-box for “except if the subject contains specific words”. In the bottom window that displays, click on the “specific words” link. Give your new rule a name. Select the check-boxes for “Run this Rule now” and “Turn on this rule”. 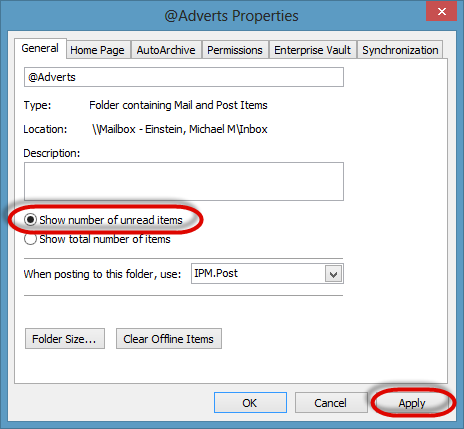 Your new rule will now go through your entire Inbox and move any Email messages that match the criteria to the “@Adverts” folder. That’s it! Only a few minutes to set-up, but will greatly improve the quality of your Inbox! From now on, any Emails that contain the word “Unsubscribe” in the message will get moved to the specified folder, unless they have "RE:" in the Subject. I again want to extend a thanks to Peter Leigh of the Mindful Marketer for this Email tip, which appeared originally on his blog. 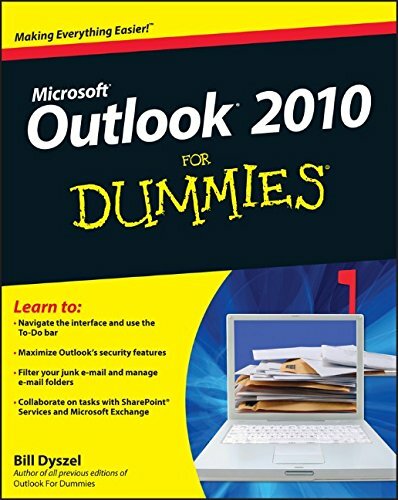 I’m always looking for easy ways to help reduce your Email Overload, and this Outlook Rule can be a big help for many people. What I also like about this rule is that it is simple to customize. If necessary, you can enhance it to exclude Emails from specific people or with other keywords. 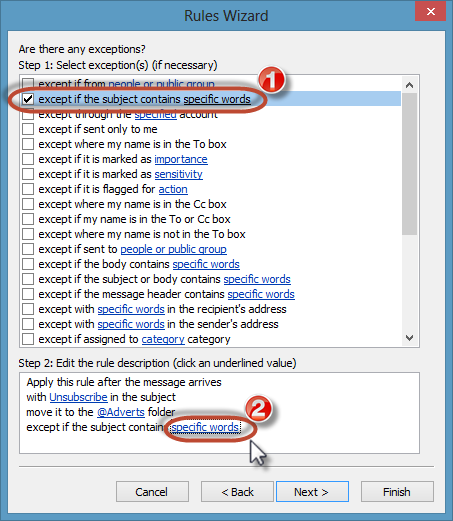 Just add in your other “exclusions” into the Outlook rule, and they will continue to route to your Inbox as normal. And this Junk Rule can be a nice complement to an existing newsletter rule you may already have. Just don't forget to check your "@Adverts" folder from time to time. Important and legitimate messages may get "caught" by this Email rule, so ensure you periodically scan this folder as part of your Email processing workflow. 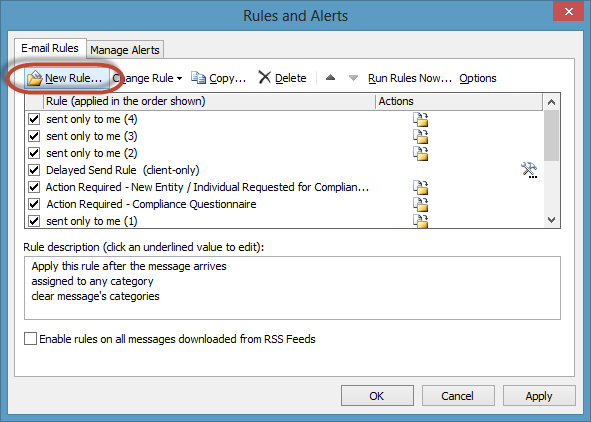 What do you think of this Outlook Rule? Can you see it as something that can make your Email processing more effective?